I’ve always found discomfort with the phrase "publish or perish" because it inverts the motive of most academicians. Though true for budding scientists and tenure wannabes, most mainstream science professors publish in order to share their joy of discovery. During the first half of my career, my main scholarly output took the form of research articles published in peer-reviewed scientific journals such as Science, Geology, the Geological Society of America Bulletin, Quaternary Research, The Review of Archaeology, and Environmental Management. Many others were invited chapters in edited review volumes such as the Geological Society of America’s Decade of North American Geology and the American Quaternary Association’s Late Quaternary Environments of the United States. Though I still publish in journals, for example, Bioscience, American Antiquity, Quaternary International, and the Journal of Taphonomy, my main scholarly output has shifted to stand-alone, single-authored books, the last of which was vetted by a committee of Harvard faculty and peer reviewed by multiple experts. For a complete list of publications link to my Academic Curriculum Vitae. For the full text of selected articles, link to Selected Scientific Papers. 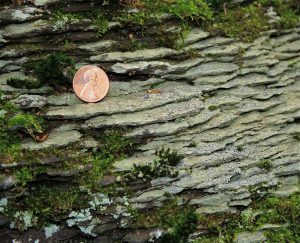 Photo: This boulder of Jurassic shale from Bloomfield Connecticut is weathering quickly because the fissile partings in the rock hold moisture that is exploited by moss, the presence of which spits the partings even more.